What is a cold plate? A cold plate is a metal object that connects to soda fountains, bar guns, and other dispensing systems to chill beverages as they dispense. The plate is cooled by submerging it in ice, and the beverage is chilled as it passes through the plate. Each plate has a specific number of circuits, or "passes," that indicate how many separate connections it can support, and each connection includes an inlet and an outlet. Therefore, a cold plate with seven circuits can cool seven separate beverage lines, and it will feature seven inlets and seven outlets. Increase the efficiency and convenience of your commercial kitchen or bar operation with the Advance Tabco CR-44X36SP-7-L stainless steel pass-through workstation. 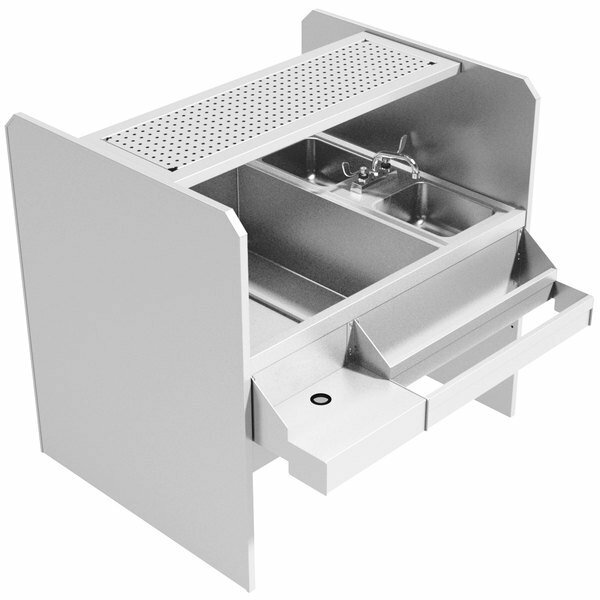 This unit boasts two deep drawn sink bowls that measure 9'' x 9'' x 4", along with a K-124 deck mounted swing spout faucet and sturdy side panels with a removable perforated drainboard top. The versatile, insulated ice bin is featured on the left side and has a 210 lb. capacity. Additionally, a cast aluminum 7-circuit cold plate is fitted on to the bin's bottom. Other features include a front apron, integrated tubing chase for soda gun, double tier speed rail, and a blender shelf with a hidden 15A/120V duplex outlet. The sink bowls both feature 1 1/2'' IPS drains, while a 1/2'' drain helps remove melted ice and water from the ice bin. A 3 1/2'' basket drain is also included. This all-in-one Advance Tabco unit is perfect for any drink-serving operation. This Item Ships via Common Carrier. For more information and tips to help your delivery go smoothly, click here. This product can expose you to chemicals including di(2-ethylhexyl)phthalate (DEHP), which are known to the State of California to cause cancer, birth defects, or other reproductive harm. For more information, go to www.p65warnings.ca.gov. WARNING: This product can expose you to chemicals including di(2-ethylhexyl)phthalate (DEHP), which are known to the State of California to cause cancer, birth defects, or other reproductive harm. For more information, go to www.p65warnings.ca.gov. This item meets the standards imposed by NSF International, which focuses on public safety, health, and the environment. This item was made in the United States of America.